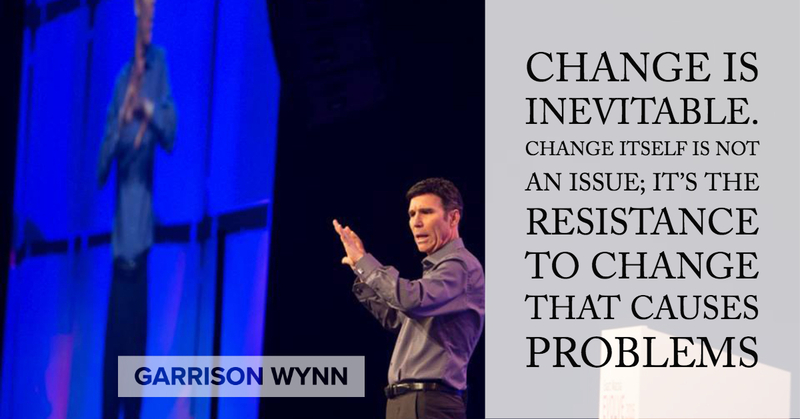 Reduce employee resistance to change with award-winning change management speaker Garrison Wynn. Renowned for his dynamic blend of original high-impact humor, customized research driven content and proven solutions for successful change. This funny, insightful keynote combines relationship building with no-fluff motivation and change to deliver real solutions in uncertain times. Garrison examines the challenges we face and shows how we can laugh at our problems while using them as catalysts for success. This session covers a lot of ground and provides no-cost, easily implemented, proven solutions that your people can use right away. Nobody wants to be a "senior beginner"
Resistance to change is the issue. Change happens; and while we can’t control much of the world changing around us, we can control how we respond. We can choose to anticipate and embrace changes or resist them. When things change, people are afraid they will no longer be experts. They will have to learn the new way, and no one wants to be a continuous senior beginner. Our studies show that to make change work, we have to prove to our key people that the change means getting better (or at least equal) results than the old way, assure them that their experience has value, and then get them to spread that message through the organization. When you tell someone you know exactly how they feel, you rob them of their uniqueness. Our three-year study of top communicators showed that when someone tells you their core issues and you say, “we had a situation exactly like that last month, and as a matter fact the guy looked just like you, and this is what we did,” you create your own resistance. They will then try to show you how their problems are special and need more of your attention. However, if you acknowledge the difficulty of their problem and then share your experience in similar situations (the key word being similar), they are more likely to use your solutions. Change is Mandatory… Stress is Optional! Change is something we all have to deal with, but the stress that accompanies change is more of choice. In this heavily researched session, Garrison applies his signature humor to a very serious topic. This fun, comprehensive program offers tools and tips for getting through big change with very little stress. More importantly, it creates an emotional shift for attendees as they see how much control they have over how change affects them. This session also shows attendees how stress is more about what we believe than it is about what is actually happening. 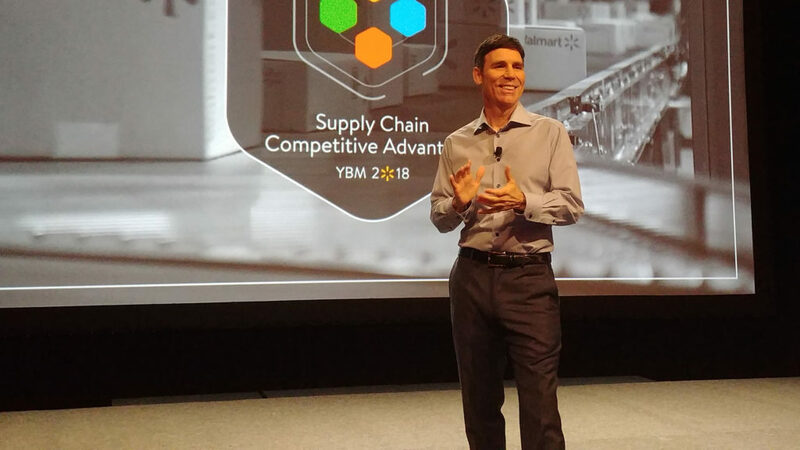 From embracing big transitions in technology to dealing with growth or downsizing, this presentation helps leaders, employees , nd customers implement necessary changes with minimal resistance. During change, one of the most important elements for success is management’s ability to listen and communicate effectively. Leaders that can consistently challenge, motivate, and educate their people through change are successful. Our natural reaction to change, even in the best circumstances, is to resist. Awareness of the business need to change is a critical ingredient of any change and must come first. There is no better way to minimize resistance to change than to involve those responsible for implementing it and those affected by it. If there is no involvement early on in the planning, during the implementation and throughout perpetuation, the change effort will fail. When people feel that they are valued participants in planning and implementing the change, they are more likely to be motivated toward successful completion. Research shows that executive involvement is the greatest contributor to change management success..If people don't know "what" the change is and "why" it's being implemented, then "how" to implement the change is a mute point. Change leaders must show alignment with senior management's business objectives. and back up words with behaviors and actions that support change. Garrison’s Change Management Keynotes Deliver Proven Solutions To Top Change Issues That Managers And Change Leaders Can Implement Right Away. A good change management team member: what are the most important criteria? How are your senior managers, mid-level managers and frontline supervisors equipped to manage resistance to change? During organizational change, perception equals reality: The level of stress an employee feels during organizational change is proportional to the level of perceived threat. Managers need to anticipate and adjust their communication to minimize the perception of threat during change. Garrison Wynn’s change management keynote presentations address common problems leaders and change management teams face during mergers, acquisitions and organizational change using high-impact humor, research results from highly successfully managers and organizations, customized content based on interviews and/or change assessments with your key people. Garrison is consistently chosen as the keynote speaker for events by Fortune 500 corporations, government, nonprofits, secular industry organizations and associations that want to move beyond the limitations of traditional “best-practices” and set breakthrough objectives to achieve maximum success. Research on corporate culture has shown that organizations will not be able to sustain excellent performance over the long haul unless they have a corporate philosophy allowing them to adapt to a changing environment. A survey of 500 executives concluded that resistance was the main reason why organizational changes fail. A recent study found that 60% of the reengineering projects that failed were due to employee resistance. All change management programs can be fully customized. People want to have more organized communication systems and be on the same page with how they are communicating. Managing change requires learning the best form of communication for change related issues. For example: when to use email, when to use voice mail, when to have face-to-face meetings, when upper-level management needs to show up and be heard. It is important for executives to communicate a structured change process showing where the company is going, how they are going to get there and what results they expect at the end. Research shows that executive involvement is the greatest contributor to change management success. If people don’t know “what” the change is and “why” it’s being implemented, then “how” to implement the change is a mute point. Change leaders must show alignment with senior management’s business objectives and back up words with behaviors and actions that support change. Fix It Till It’s Broke?